« Who is Terese and why is she writing here? Monumental trips need team work. The exploration up the Lomami River, through the heart of the Congo, is monumental. Ashley is in a giant dugout and with a well-seasoned Congolese team, but none have been up the Lomami. Financial and administrative backbone – this is essential – up to the present we rely on three foundations that hold us up like a three-legged stool. A trip into unknown wilderness where there are no villages, almost no written history, and no trade requires preparation. There is the obvious like taking a truly comprehensive first aid kit and all the fuel you need to get the 35 horsepower motor all the way upstream and enough to assure your rapid return. But most striking in almost every letter Ashley sends back from the field are the unforeseen costs: the rent for the temporary base in Kisangani, the gifts to the village elders in Opala, the high prices caused by the “underground” wealth from the diamond mines, etc etc. Two foundations have given us the possibility to push ahead. Friends at the Abraham Foundation introduced us to the Arcus Foundation and suggested we write a proposal. Nancy Abraham said that she would supply matching funds if Arcus would provide the basic funding for the proposal. What better inspiration could there be? I spent a month researching and writing a complete proposal with enthusiastic support from the would-be field team. Arcus Foundation fully funded the part of the proposal we hoped they would fund. They committed to 300,000 USD over three years. And Abraham provided the match, another 100,000 dollars. Altogether, and in one step, we had half of the entire funding we needed for the first two years. A single year — at full activity – costs between 350,000 and 400,000 USD. A small NGO (Lukuru) stepped forward and offered us an administrative home from which to launch the project. Lukuru is dedicated to conservation in the south-western part of bonobo range and provides much more of a home than the word “administrative” conjures up. These are our colleagues, field mates, and among the un-dauntable. So field work could begin… and obviously has. This entry was written by Terese Hart, posted on 2007-06-19 at 4:05 pm, filed under About the project. Bookmark the permalink. Follow any comments here with the RSS feed for this post. Post a comment or leave a trackback: Trackback URL. Who is the “good spirited woman”??? The Lomami has been intriguing us for years. 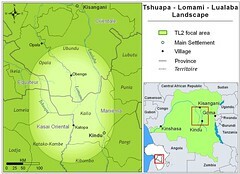 Big international conservation NGOs have worked in the big parks mainly in eastern Congo(and they are needed there!) but war, and a completely deteriorated infrastructure have kept people out of the unknown interior. It was the encouragement of Abraham foundation and then Arcus that gave us the courage to “go for it” and it is certainly promising!